Romans 1:28 … Since they did not like to retain Yahweh in their knowledge. It is true. History supports it. Our ancestors rejected Yahweh and His Laws. Refusing to accept the wisdom of Yahweh, they called upon their own reasoning, which has led them to utter folly. For those who needed proof, the science is there – discovered in 2014 – sufficient to silence the naysayers yet they continue to scoff. They dismiss their own scientific breakthrough, as they continue to reject Yahweh. Thankfully – we have Yisrayl Hawkins. Future Priests, Deacon Melchizedek, and Deacon Sholomo were the first two speakers of the day. Their topics focused on Yahweh’s Creation – why He created mankind and the beneficial impact the soil microbes have throughout the earth. Next, we heard from Great Kohan Nathanyah, who began his sermon by declaring the Sabbath Day as glorious. Reading from the First Book of Yisrayl, Making the Connection, and quoting the Greatest Teaching in World, the Kohan states that The Sabbath is the most important thing in our lives. It helps us to make a connection with Yahweh but his words come with an exhortation to remember that the connection is only a slight one and fragile and it is up to the individual to build upon it by keeping the Sabbath Day as is taught in The House of Yahweh. He debunks the common misconception that an atheist is one who does not believe in the Creator and states the truth is far simpler – they haven’t been taught and without an education in the scriptures, the knowledge of Yahweh is absent in their lives. However, to we who believe it is our strength and stability. Another misconception is the fallacy that the love between Yahweh and man is unconditional. To the contrary, Yahweh’s Laws clearly express the conditions that we must observe and obey. The Kohan also addressed the subject of disrespect by reading excerpts from The Peaceful Solution Character Education Program, the Respect Unit. We should prepare for disrespect, be ready for it, without the urge to retaliate. It is an overcoming process, which we must accomplish in order to come into the likeness of Yahweh. Stressing that if we find peace in retaliation we ought to realize it comes from an exposure to entertainment with influences that easily pass into our character. Kohan Nathanyah asks that we consider this and not allow our minds to be entertained but rather strive for moral excellence. The Great Kohan Yliyah presented the news showing California towns running out of water, locusts consuming crops in Madagascar, Pope Francis endorsing war, and a sermon by a preacher, condoning revenge as a means of retaliation. 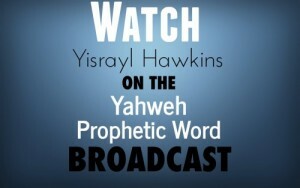 Then we heard from our Great Teacher, Overseer Yisrayl Hawkins. Today, he re-visited the scientific news report disclosing the age of a recently found dinosaur bone. The soft tissue places the extinction of dinosaurs to Noah’s time and the great flood described in scripture. The findings solidly debunk the “millions of years ago” theories, yet they reject the findings – they fired the scientist, a 30-year veteran, a lawsuit is next. Presenting the significance of Henry Kissinger’s latest book, which details the crisis of the new world order, Pastor goes over some key points from the article and aligns them with Malachi Martin’s book, The Keys of This Blood. Since 1948, plans of the Catholic Church have moved steadily forward. Scripture revealed long ago how it would end – Genesis 49 describes the twelve tribes for this time period. From changing Yahweh’s Name, His Laws, and the Name of His House – The House of Yahweh – to the temple. Yisrayl reminds us of Yahshua’s words about a house divided will fall. He reassures us that Yahweh’s Kingdom, His Government will be managed in unity, – and it will stand and never fall. We conclude the review on a simple fact – they promise liberty but they only bring death.